"God is also a living being like you and me. He's also a person, as you are person, I am person. But the difference is that one person is providing all the necessities of unlimited persons. And we unlimited persons, we are dependent on God. This is our philosophy. Another philosophy is that everything belongs to God; nothing belongs to us. That's a fact. Therefore as sons of God, everyone has got the right to use father's property. But he should not take more than he needs. That is our philosophy. If one takes more than what he needs, then he becomes a criminal. So similarly, we can live very comfortably on this planet, because this planet belongs to God. We should not designate ourself as 'Englishman,' as 'American,' as 'Indian,' as 'African,' and fight amongst themselves. We should always know that we are all sons of God. The property is God's. 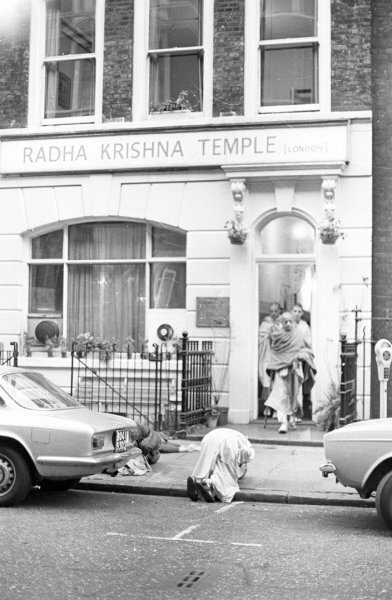 We can use whatever we need by the grace of God -- the supply is there; there is no question of scarcity -- and thus save your time, be peaceful, and chant Hare Krishna."